The new MONARCH HG 30mm series follows in the footsteps of its award-winning 42mm siblings in delivering class-ruling optical performance, unrivaled ruggedness and exceptional handling. 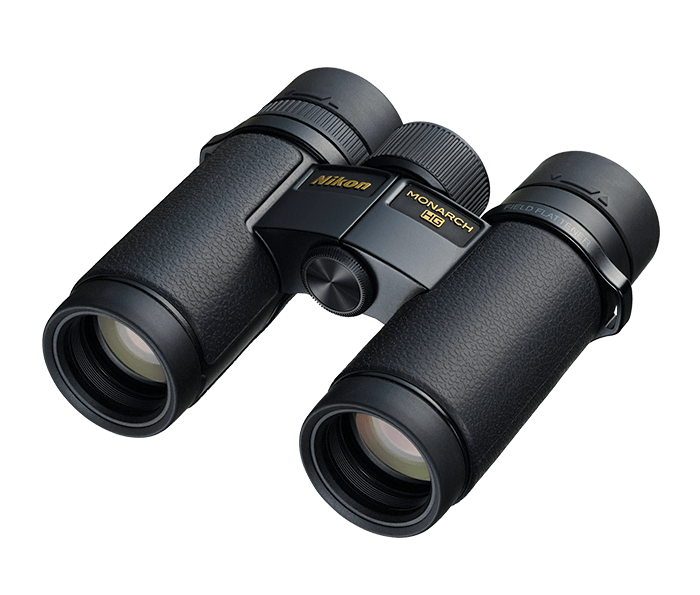 Engineered throughout to maintain the performance specifications of the original 8x42 and 10x42 models, the new 30mm MONARCH HG binoculars do so in a smaller size and nearly 8-ounce reduction of weight. Extraordinary optical performance is key to the new MONARCH HG 30mm binocular. The optical system of the MONARCH HG is engineered around its ED (Extra-low Dispersion) glass and high-quality multilayer coating that is applied to all lenses and prisms for brighter, higher resolution viewing. Nikon’s Field Flattener Lens System works in conjunction with MONARCH HG 30mm’s extraordinarily wide field of view—8.3° and 6.9° respectively in the 8x30 and 10x30 models—to provide a sharp, clear view to the lens periphery. This matches the FOV of the 42mm models. The new 8x30 and 10x30 MONARCH HG are built with a body made from magnesium alloy providing optimum strength, impact resiliency and weight reduction. The slim body profile is further enhanced with rubberized panels to provide a sure grip in any condition. To assure long-term optical acuity, all MONARCH HG objective and eyepiece lenses are protected by scratch-resistant coatings, while interior lenses are shielded from fogging with an impressive waterproof rating that assures fogproof integrity even at altitudes equivalent to 16,000 feet. To maintain your personal diopter setting, MONARCH HG binoculars integrate a locking diopter adjustment ring. Lift to adjust, push down to lock.